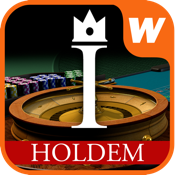 Casino Hold'em is a variation of the popular Texas Hold'em poker game. Casino Hold'em differs from Texas Hold'em in that you have to play against the house rather than against other players. Beat the Dealer's hand by getting the best possible five-card hand out of the two cards you are dealt and five community cards. Get more excitement placing side bets and get payout if a pair of Aces or higher is dealt in the first five cards!